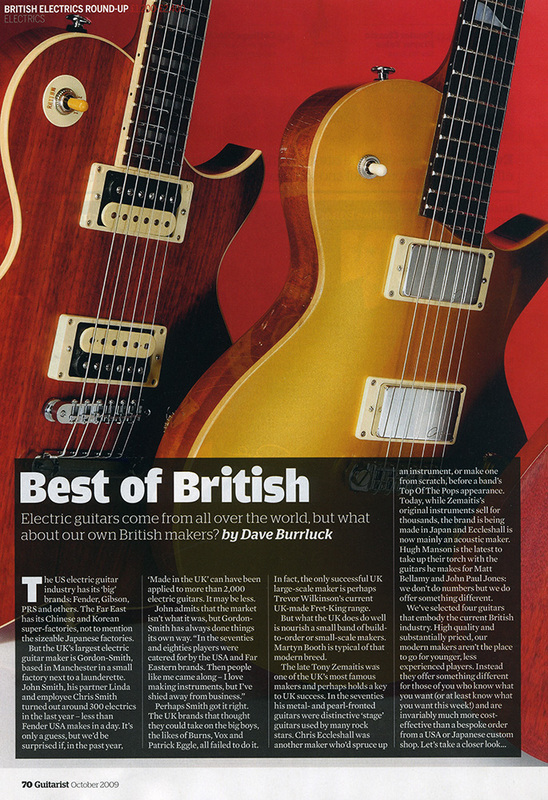 Electric guitars come from all over the world, but what about our own British makers? OPTIONS: Ebony fingerboard. 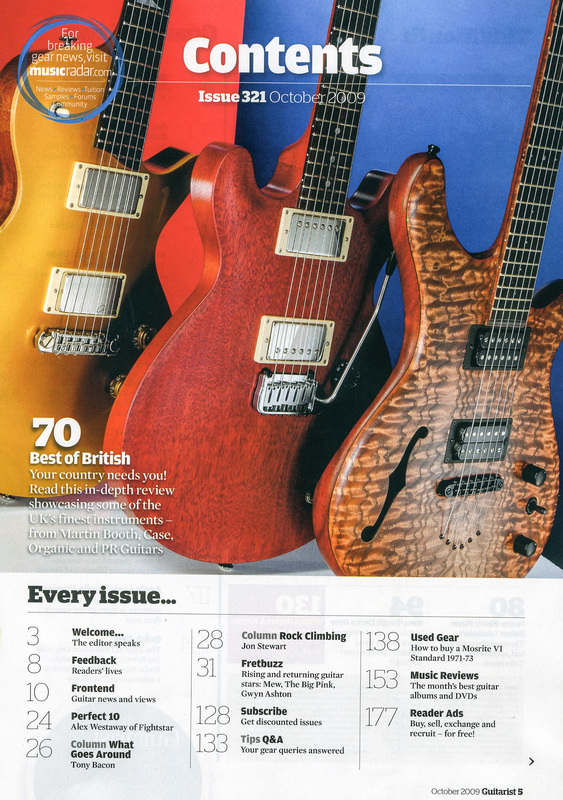 Alternative tuners and pickups plus dimensions and fretwire – all £POA. We’ve rocked our quartet of British high-end electrics, but the question is, which one do you want? 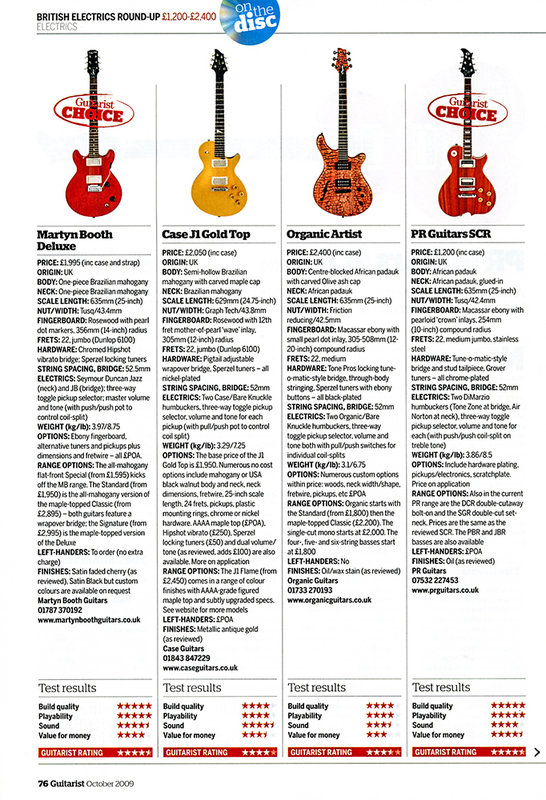 Our four review guitars prove that we have some world-class talent building very fine electric guitars here in the UK. Few of our British makers advertise or PR their wares; many still work for local stores as repair men, both to keep learning about guitars and also to provide an oft-needed additional income. Most of them enjoy a local rather than national (let alone international ) reputation . You’ll rarely find a UK-made electric in your local store (of our four instruments, only Martyn Booth’s guitars are currently available and then only via two retailers), which doesn ‘t make it easy to try before you buy. In most cases, aside from visiting the maker ‘s workshop, the only way to try an example is at one of the numerous UK guitar shows, though that’s rarely the best place to audition an instrument. Some customers will be drawn by the ‘hand-made’ aspect, but our advice is to look at the finished article. Is a guitar better because it’s made with old-school techniques and tools such as chisels and pinrouters (the meaningof ‘handmade’) as opposed to the parts being cut on computer-assisted routers or milling machines? In our opinion the tool is irrelevant- it’s the design, the wood choice, the fit and finish, the hardware, playability and sound that’s important. But the choice is yours … Currently Martyn Booth, Organic and PR Guitars build specific models with various options; Case does too but he’ll happily discuss a custom guitar, from scratch. The former method at least means you’ll have a pretty good idea of what you’ll get. The latter, of course, might seem a great idea on paper, but it will be more expensive, and even if undertaken by an experienced luthier may not turn out to be the guitar of your dreams. Yet any of us who’ve ever commissioned a custom build will admit it’s quite an experience, like being measured for a bespoke suit. You choose your cloth, your cut and your detail. Your unique guitar could well serve you for a lifetime of playing. But be warned: if you need to sell it, someone else might not see the virtue in that green polka dot seven-string-with-Floyd Rose you commissioned. 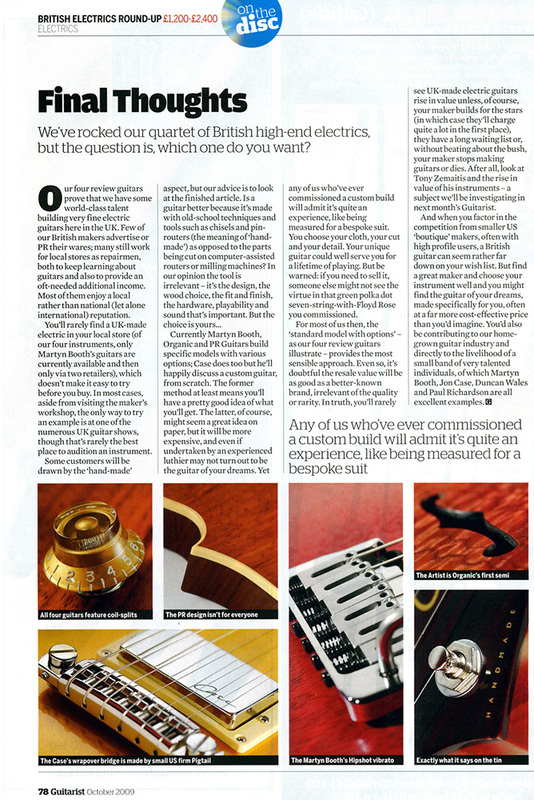 For most of us then, the ‘standard model with options’ – as our four review guitars illustrate – provides the most sensible approach. Even so, it’s doubtful the resale value will be as good as a better-known brand, irrelevant of the quality or rarity. In truth, you’ ll rarely see UK-made electric guitars rise in value unless, of course, your maker builds for the stars (in which case they ‘ll charge quite a lot in the first place), they have a long waiting list or, without beating about the bush, your maker stops making guitars or dies. After all, look at Tony Zemaitis and the rise in value of his instruments – a subject we’ll be investigating in next month’s Guitarist. And when you factor in the competition from smaller US ’boutique’ makers , often with high profile users, a British guitar can seem rather far down on your wish list. But find a great maker and choose your instrument well and you might find the guitar of your dreams, made specifically for you, often at a far more cost-effective price than you’d imagine. You’d also be contributing to our homegrown guitar industry and directly to the livelihood of a small band of very talented individuals, of which Martyn Booth, Jon Case, Duncan Wales and Paul Richardson are all excellent examples.